As part of their continuing drive to promote upcoming Evil Rising album, The Heretic Order have unleashed an official video for their track of the same name. Although release isn’t due until later this month, they also streamed a full, special album show via Total Rock in May, which you can now watch on Metaltalk here. With new album, The Outer Ones, scuttling its way into our dimension this September, Revocation have laid the plans for a string of live US appearances. From the sound of the sample clip available on their Facebook page, there’s some truly maniacal music in the offing. Support comes from Exhumed, Rivers Of Nihil, and Yautja. Former members of Moesaboa and Number One Son having joined forces for a new project. Chandrian Kill will release their debut EP, Bring Out Your Dead, this September 7th. Here’s the teaser for July 4th single, I Collide. Dundee metallers Catalysis recently put out a lyric video for their track, Deadline, with updated line-up (now featuring Col Macgregor on vocals), mixed by Aborted‘s Mendel Bij De Leij. 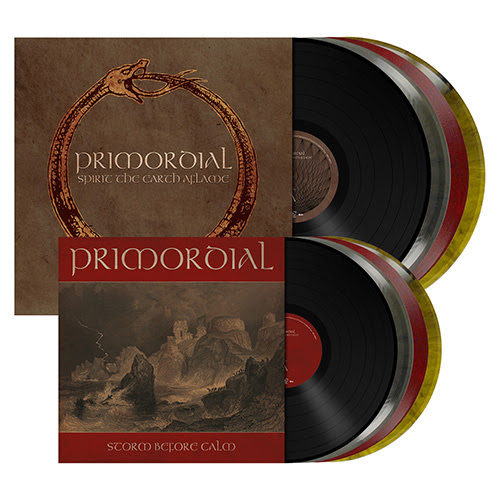 On July 13th, Metal Blade will be re-issueing two classic albums from Irish black metallers Primordial. Spirit The Earth Aflame and Storm Before Calm will both be available on vinyl, remastered, and with restored artwork and posters. Pre-orders are available now from EMP and Ebay. Beyond The Black have new material coming in the Heart Of The Hurricane album, due for release August 31st. Get an advance peek at the title track with this lyric video, and check out the pre-order formats at Napalm Records. The second full-length from North Carolina death metallers Abhorrent Deformity – titled Slaughter Monolith – is creeping up on an August 3rd release. Fresh out of the box this week, here’s the video for Ripped From A Mother’s Mutilated Womb. Good clean stuff. Posted in Latest News and tagged Abhorrent Deformity, Aborted, Beyond The Black, Bring Out Your Dead, Catalysis, Chandrian Kill, Deadline, Dragon Fire, Evil Rising, Exhumed, Heart Of The Hurricane, I Collide, Mendel Bij De Leij, Metal Blade, Metal Blade Records, Metal News, Metaltalk, Moesaboa, Napalm Records, Number One Son, Primordial, Revocation, Rivers Of Nihil, Rock News, Slaughter Monolith, Slow Dragon Music, The Heretic Order, The Outer Ones, Total Rock, Yautja.